New car and truck sales by franchised dealers in the Houston area plunged 22.6% in March from a year ago, to 20,934 new vehicles, with sales of cars down 30.7% and sales of trucks and SUVs down 17.7%. This is the type of plunge Houston went through during the Financial Crisis. By comparison, in the US overall, new vehicle sales declined 1.6% in March, despite record incentives that desperate automakers threw at the market. There are no green shoots.The first quarter, with 69,936 new vehicles sold, was the worst quarter since Q1 2011, according to TexAuto Facts, published by InfoNation, and cited today by Greater Houston Partnership. It was the 15th month in a row of year-over-year declines. For the 12-month period through March 2017, Houston area dealers sold 285,000 new vehicles, the lowest rolling 12-month total since the 12-month period through April 2012. And it’s down by a quarter from the range of 375,000 vehicles that had prevailed in 2014 and 2015. The irony? In February, the industry blamed the Super Bowl, which Houston had hosted, for the sales fiasco. They claimed people stayed at home that weekend due to fears of traffic nightmares. But there was no Super Bowl in March, and yet the plunge continued unabated. The average sales price fell to $36,537 as the percentage share of trucks and SUVs in the mix inched down to 67.9% of total sales, from 68.3% in February. With trucks and SUVs being priced higher than cars, the average price per vehicle declined. This is not good for dealers. Their profit margin is much larger on trucks and SUVs than on cars. That cars, which are cheaper, gain on trucks in Houston is not exactly a common occurrence. The 175 or so franchised new vehicle dealers – not counting the independent used car dealers – in the Houston area employed about 30,000 people, according to the Houston Automobile Dealers Association. But that was before the sales collapse started. Businesses react to that kind of meltdown by trimming their expenses where they can. Cutting staff and advertising are the two places where they can have the largest and quickest impact. And that has further repercussions for the economy. Yet the signs that Houston is somehow recovering from the oil bust – that in fact the oil bust is over and that the billions are once again flowing from Wall Street and the banks into the fracking industry, particularly into the newly declared El Dorado of fracking, the Permian Basin in West Texas – have been touted for a while. And there have been some timid signs. In March for example the Houston Purchasing Managers Index came in at 51.4 (over 50 = expansion), up from 45.9 a year earlier, according to the Greater Houston Partnership. And home sales are up so far this year, as is the median price. Nonresidential new building contracts and permits, however, totally collapsed and are trying perhaps unsuccessfully to find their bottom. While employment overall has inched up 0.6% year-over-year, the goods producing sector, which includes construction, continues to shed jobs, down 3% year-over-year. In the Houston-Sugar Land-Baytown area, the unemployment rate has reached 5.9%, up from 4.8% a year ago, the highest since September 2013. 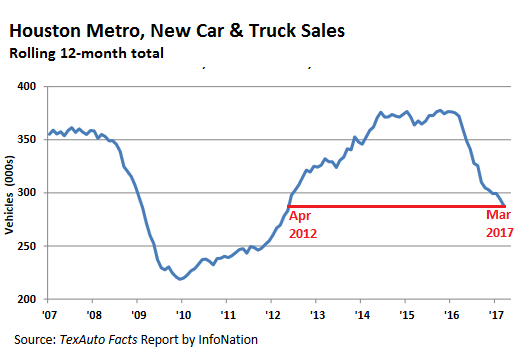 And total retail sales, which include new vehicle sales, dropped 4.7% in March year-over-year, and are down 4.0% year-to-date. Hotels are suffering too. In Q4, the latest figures available, occupancy dropped to 57.2% from 64.3% a year earlier, and revenue per available room plunged 17% to $56.67. Houston’s economy is a lot more diversified than it was during the last oil bust. So what auto dealers are feeling is not just the oil bust but the bust of the vast construction sector – office space, healthcare, and petrochemical plants, all going down together – and the pain of sectors that are directly and indirectly affected by the construction sector. And they’re all just trying to manage the crash.